When you’re cheap and dirty, you don’t normally have access to really awesome but unbelievably expensive luxury items like tanks. When we do get the opportunity to get hands on with such things, we tend to act very timidly despite the really awesome scenarios we always imagined getting into should we come into possession of a tank. 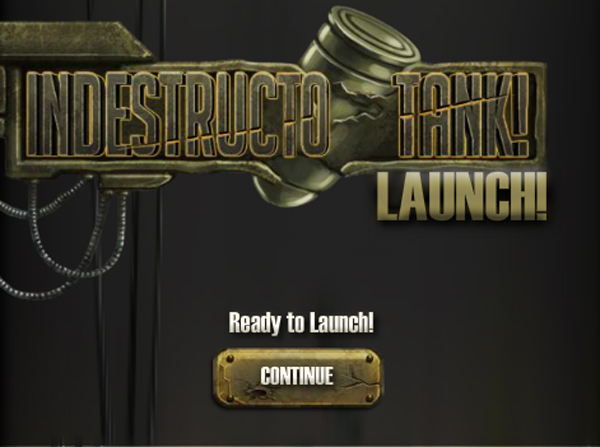 This is the ultimate contradiction and the game Indestructo Tank: Launch should be your portal out of a world of safety and thoughtfulness and into a place where attaching rockets to the bottom of a highly armored vehicle and launching yourself into space is not only accepted, it’s recommended. I’d speak about the plausibility of Indestructo Tank: Launch’s plot, but that would mean admitting that I’m a square and I most definitely am not. I can say, however that a game whose entire goal is to destroy a satellite that’s preventing the enemy from NOT shooting at you is a game whose developers are most likely fueled by cocaine and painful high fives (like the kind you get when your hand is wet or when you make the mistake of high-fiving a secret nemesis). How do you get to that satellite you may ask? 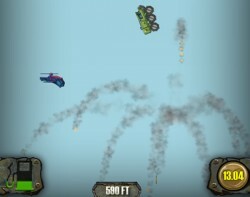 Well by launching your tank into the air and bouncing off enemies’ planes and helicopters, of course! Isn’t that obvious? What looks like failure to some is actually success to others. ITL is a time sink that doesn’t require a whole heck of a lot of time to get to the fun part, which is nice because once you smash your first jet and fly way up into the sky, you’ll begin looking for ways to achieve the same results in real life. While I respect your thirst for super fun good times, I can’t recommend following that path (though I really want to). Besides, it takes a bunch of upgrades (which can be purchased with the coins you get for destroying things and soaring through the air) to finally leave the atmosphere and paying your rent is far more important. This game made me smile, which is a good thing, unless you’re the type that prefers a stoic demeanor. Even then, I’m sure you’ll smile on the inside unless, of course, you’re the type that doesn’t like tanks. Should that be the case, you need to get a life – tanks are nature’s ways of thanking humans for being its most successful species. ITL is available for Android and iOS as well!